Nobody truly yearns to be in the heat constantly, occasionally it's nice to roll down the windows and cruise; but air conditioning was invented for a reason, so why let it malfunction? We recommend checking your vehicle’s A/C annually will help you keep your cool when temperatures soar. 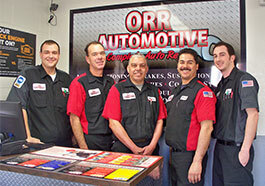 Orr Automotive’s free personalized schedule and email reminder service is a simple way to help you take better care of your vehicle this summer and throughout the year. It is an easy-to-use resource designed to help you drive smart, save money and make informed decisions.